Los Angeles—On Jan. 14, teachers of United Teachers Los Angeles (UTLA) went on strike for a new contract with the L.A. Unified School District (LAUSD), the second largest school district in the country. Ninety-eight percent of the teachers approved the strike, the first since 1989. Teachers with support of communities, parents and labor allies have begun to picket schools. A few of the thousands of teachers, school workers, and supporters who demonstrated in front of City Hall on Jan. 15, 2019. Photo: Buddy Bell for News & Letters. In January the LAUSD had offered a measly 6.5% pay raise and only $75 million for smaller class sizes, far short of what their reserve of $1.8 billion could provide. Teachers object to current class sizes in excess of 45 students. Superintendent Austin Beutner, with no educational experience, is a Wall Street advocate for charter schools, where one-fifth of the 800,000 LAUSD students go. 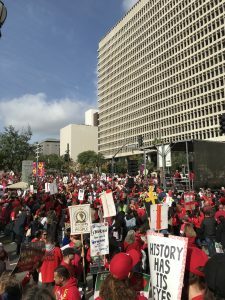 Last Dec. 15 over 50,000 teachers, parents, students, labor unions and non-teaching school employees gathered at the Los Angeles City Hall in support of a new public education contract. Teachers gathered to march for fair wages, smaller class sizes—which means hiring more teachers—special education, nurses, counselors, librarians, social workers, and less testing. In support were members of Black Lives Matter, the PTA, the Community College Association and unions like the UAW, SEIU and UniteHere. This entry was posted in Articles and tagged American Federation of Teachers, Austin Beutner, Basho, charter schools, Eli and Edythe Broad Foundation, Los Angeles Unified School District, public education, teachers strike, United Teachers Los Angeles, UTLA. Bookmark the permalink. I heard that the strike won some demands but little was conceded on excess class size. Certainly charter operators hope that public education will continue to be squeezed both financially and by the working conditions that drag teachers down. And they don’t want just “50%” of LA schools to become charters; they want it all, as in New Orleans where the Black community is fighting to keep the last public high school in the city from going charter.